"An aged man is but a paltry thing / A tattered coat upon a stick," wrote William Butler Yeats in "Sailing to Byzantium," composed in the poet’s early sixties. 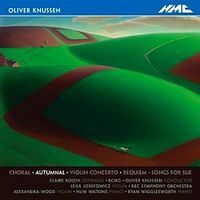 The advent of Oliver Knussen’s 60th birthday a few months ago seems to have sparked similarly somber reflection in the British composer. Knussen’s recently released album of eight short works that have never been recorded before is swathed in the cadences of memorial and elegy. It stands in stark contrast to the celebratory spirit that surrounded the composer’s extensive birthday celebrations, which reached their climax in November with the BBC and Barbican’s Oliver Knussen: Total Immersion Festival, a wide-ranging retrospective of Knussen’s career. Many of the tracks were composed in memory of the composer’s friends and loved ones. Notable examples include Reqiuem – Songs for Sue, a song cycle based on poetry by Emily Dickinson, Antonio Machado, W. H. Auden and Rainer Maria Rilke composed following the death of Knussen’s wife in 2003 and performed here with intense warmth by the soprano Claire Booth and the Birmingham Contemporary Music Group, and the meditative violin solo Secret Psalm, originally written in 1990 for a memorial concert for Michael Vyner, the artistic director of the London Sinfonietta. A funereal atmosphere hangs over even the most youthfully-composed of the offerings. In Choral, a dark-hued piece written when the composer was 20 as a response to the death of the Catalan composer Roberto Gerhard in 1970, instrumental "choirs" grind out pulsating, slow-moving chords. Written as a memorial to Benjamin Britten, Autumnal (1976-77) performed by violinist Alexandra Wood and pianist Huw Watkins, moves from the austerity of bare chords to the uncertainty of delicate tremolos across its two brief movements. Meanwhile, with its limpid, ringing chords reminiscent of the sepulchral timbres of Debussy’s prelude La Cathédrale Engloutie, the piano solo Prayer Bell Sketch (1997) evokes a hushed wake. Only with the final track of the recording, the gorgeous Ophelia’s Last Dance (2010) liltingly performed by Huw Watkins, does the mood ever so slightly lift. Yet the melody dates back to 1974, showing that even in a happier frame of mind, the composer remains haunted by the past.